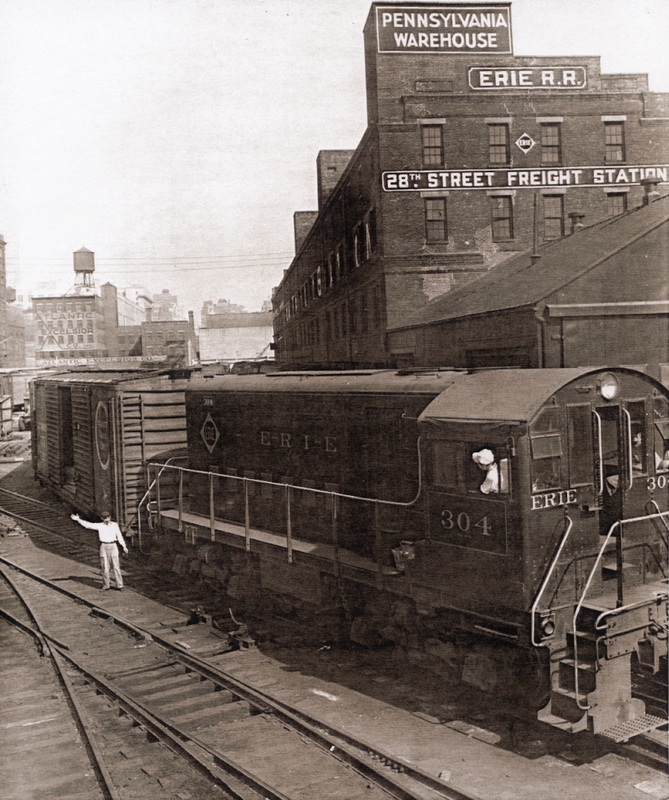 The Erie Railroad, like many other trunk line railroads on the west shore of the Hudson River, opened an offline freight terminal in the borough of Manhattan. This Erie Railroad terminal was located at West 28th Street and opened circa 1902. 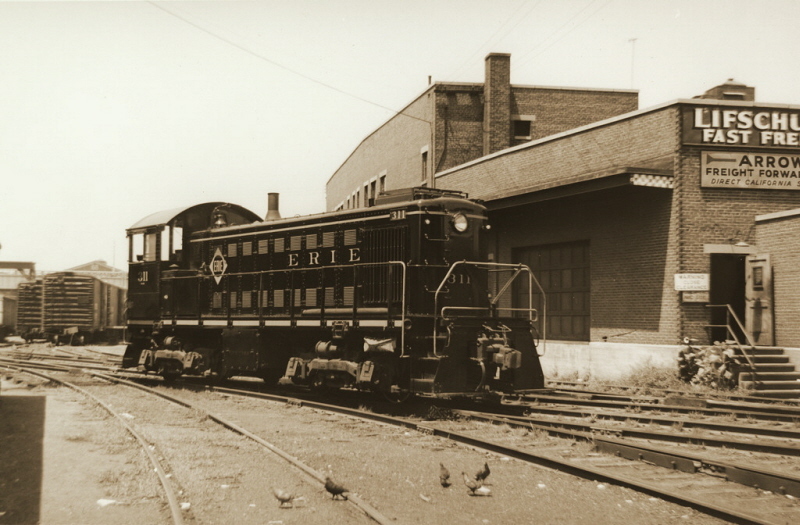 This facility was built as the result of the Erie Railroad having to relocate from their West 23rd Street Yard which was placed in service in 1868. 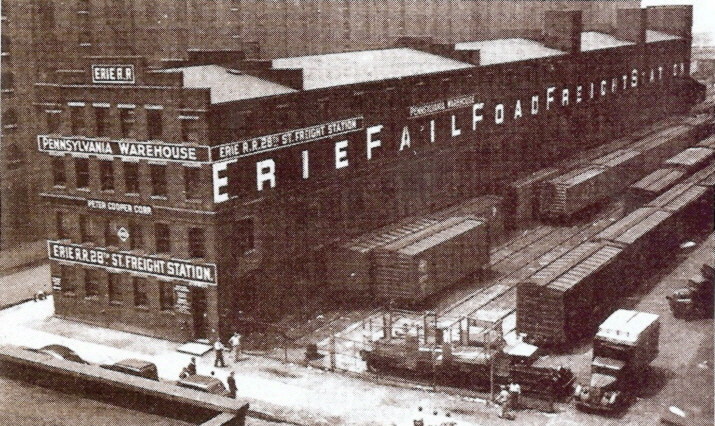 As that facility became inadequate for the larger freight cars coming into service at the turn of the century, and as the City of New York was planning on some infrastructure construction along the bulkhead, the City condemned the West 23rd Street property on which the Erie was leasing, forcing Erie to relocate their Manhattan Terminal to West 28th Street. 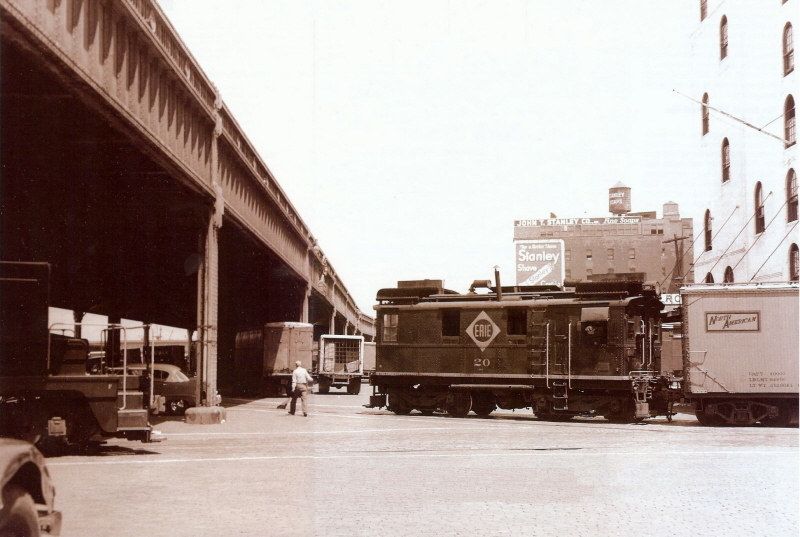 This would turn out to be to the Erie's advantage, as due to the angle of Twelfth Avenue, the West 28th Street facility was almost double in size when compared to the West 23rd Street Freight Station. This West 28th Street offline terminal closed in September 29, 1975, and the structures began to be razed in 1980. As stated above, the facility at this location was opened in 1902, however this facility would not have its own float bridge until 1909. Please refer to float bridge chapter below for in depth information. Due to the angle of Twelfth Avenue, the West 28th Street Property averaged 747 feet in length (725 feet in length on West 28th Street and 770 feet in length on West 29th Street respectively), with roughly the same 201 foot width. These dimensions total to 151,742 square feet, which is almost twice the amount of square footage of the vacated West 23rd Street facility; and without crossing a city thoroughfare. It should be noted that some property maps shows the north-south waterfront thoroughfare as "Thirteenth Avenue", while others show it as "Twelfth" Avenue. Both are correct depending on the era but for clarity, I will refer to it as Twelfth Avenue or West Street, which is the current name of the north-south avenue. Please keep in mind that image below, is an 1909 G. W. Bromley & Co. Property Map (revised 1915), and while it provides a great deal of trackage layout, it should be regarded as moderately, but not totally accurate. Fortunately, images exist during this layout period (seen below), so we can ascertain a four story brick freighthouse occupied the property in the location shown by the property map at right. 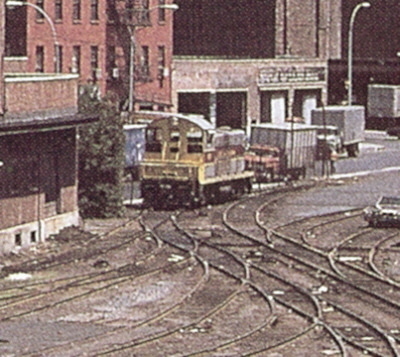 The Terminal Stores building is not connected to the Erie yard, and the track shown entering the Terminal Stores building is actually a siding of the Eleventh Avenue line of the New York Central Railroad but this structure would eventually be serviced jointly by the Erie and Lehigh Valley Railroads. The original freight house can be seen in the lower left (southeast) corner of the property. According to the legend on the Bromley map index, pink structures denote brick construction, yellow structures are wood frame construction, stone / concrete construction in light brown, and iron or metal sheathed wood construction is yellow with blue outline (i.e. pier). I have included these construction types to give the reader a better sense of the many types of structure compositions that existed in these freight terminals. The following image is a Fairchild Aerial Survey Photo taken in 1924. 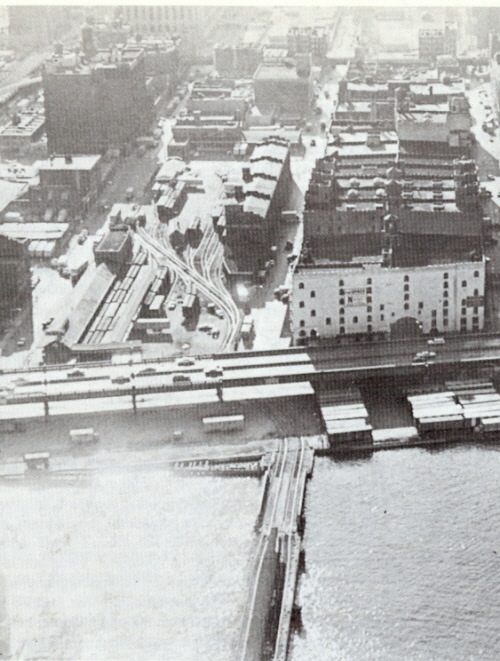 This West 28th Street Freight Station would be equipped with a float bridge allowing carfloat traffic, but it should be noted, this was not installed until 1909. 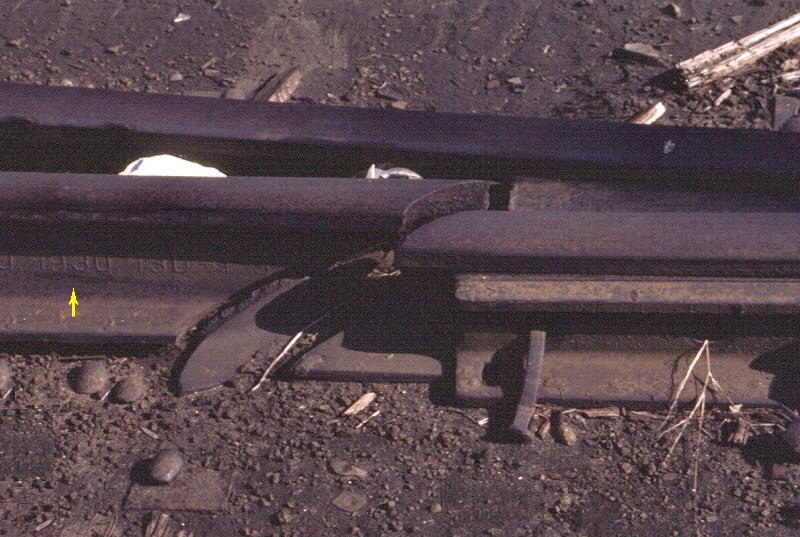 Until this date, trackage was tied into the Lehigh Valley float bridge one block south. 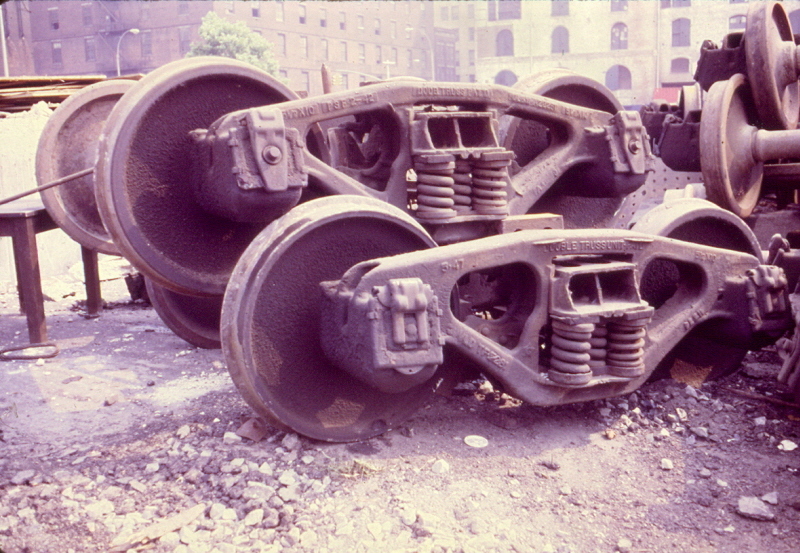 This facility was also equipped with a pier station on Pier 67 and eventually Pier 68, and carfloats would be moored directly to these piers for loading and unloading, without the freight cars needing to be removed from the carfloats. According to the 1920 Joint Report with Comprehensive Plan and Recommendations by the New York, New Jersey Port and Harbor Development Commission; the following figures are given. Looking east - Twelfth Avenue in foreground left to right. Note boxcab locomotive on Terminal Stores lead track on right side of photo! .. An unusual feature of this facility in its early incarnation, is that the yard was totally surrounded by a tall wood fence, with double door wooden gates at the entrance of each driveway between the tracks. This is unusual, but other images taken during this period of neighboring Lehigh Valley and Baltimore & Ohio rail facilities show they too have this security measure. This wood fence would eventually be replaced with a more modern steel chain link fence, which would be less maintenance intensive. Note the railyard is fenced off with wood stock fence with gates for the driveways between tracks. In 1936, a new structure was built on the northwest corner of the property, which became the outbound freight house, and was built upon the site of one of the original team tracks. More about this can be read in the Outbound Freight House chapter below.. Looking northeast. 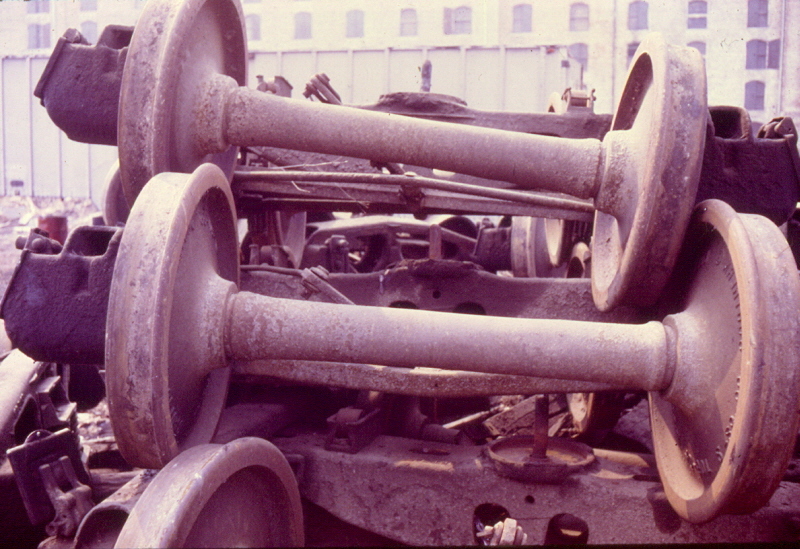 Note 5" artillery piece extreme left edge of photo, (above the flatcar and below the overhead gantry crane). That is either Erie locomotive #19 or #20 in the yard just above the street lamp. In 1944, a brick two story addition to the outbound freight house was constructed. 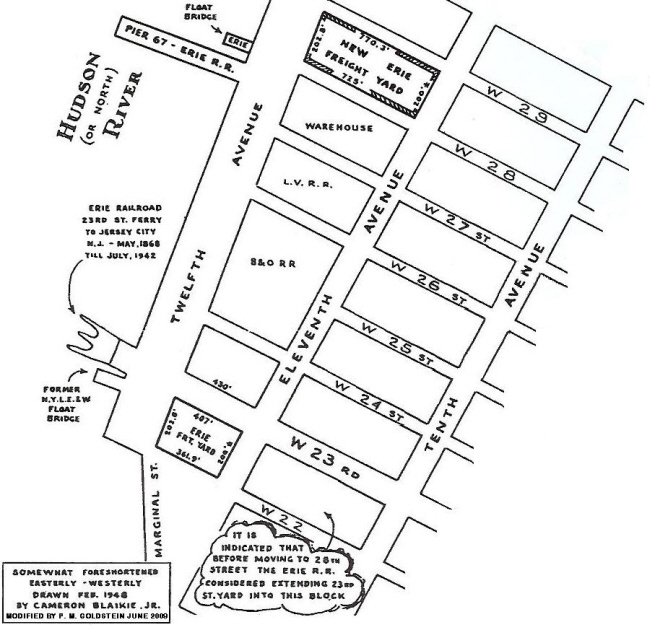 By 1954, a new set of buildings would be constructed from the southeast corner of West Street and West 29th Street, and proceeded east up West 29th Street for about half the length of the railyard. Circa 1950's, a yard office and light tower was installed and a platform was built in the northeast corner of the property. 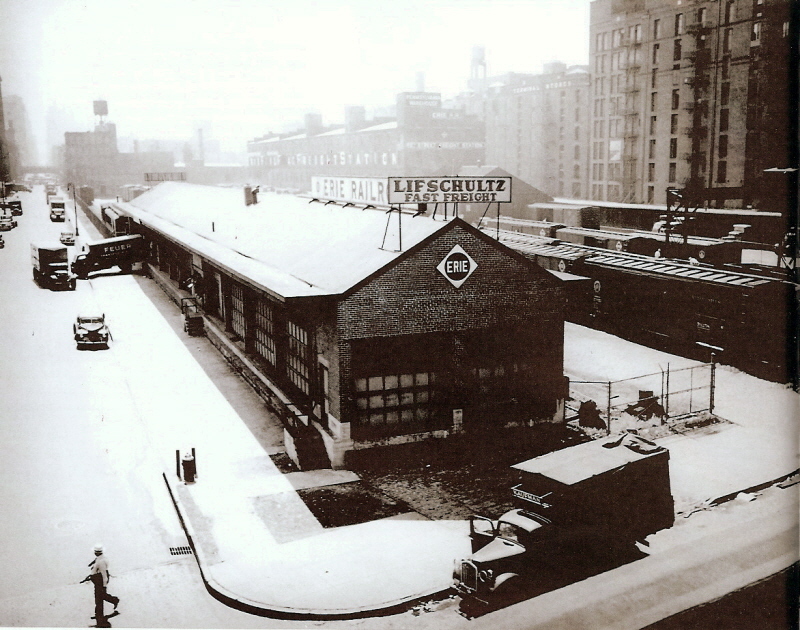 Throughout the 1960's, several changes took place: an extension to the original freight house was constructed for Lifschultz Freight Forwarders, and prior to 1964, the overhead gantry would be removed. 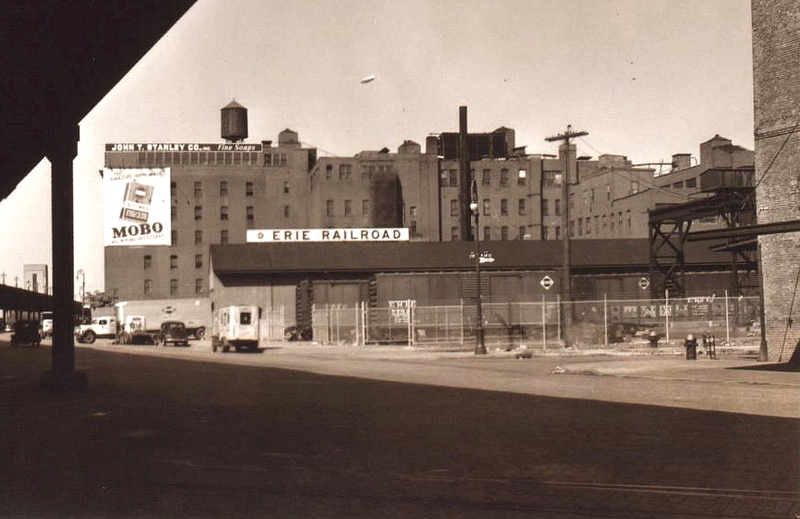 In the later years, a transfer shed would be built between the tracks south of the West 29th Street building. 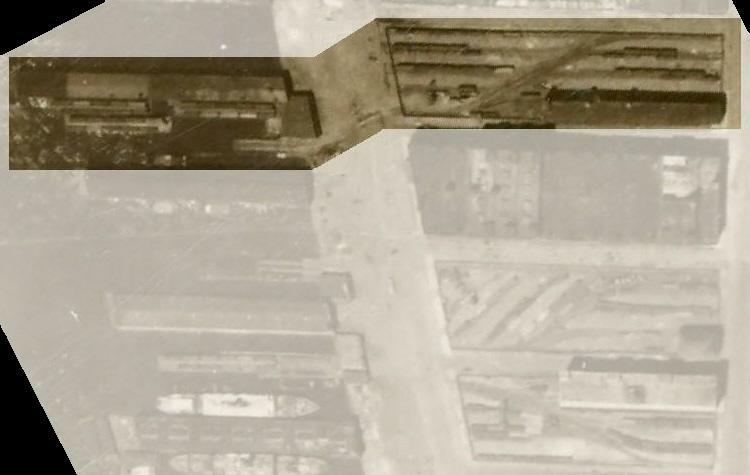 Both 1954 and 1966 aerial imagery show significant rail traffic in the yard. 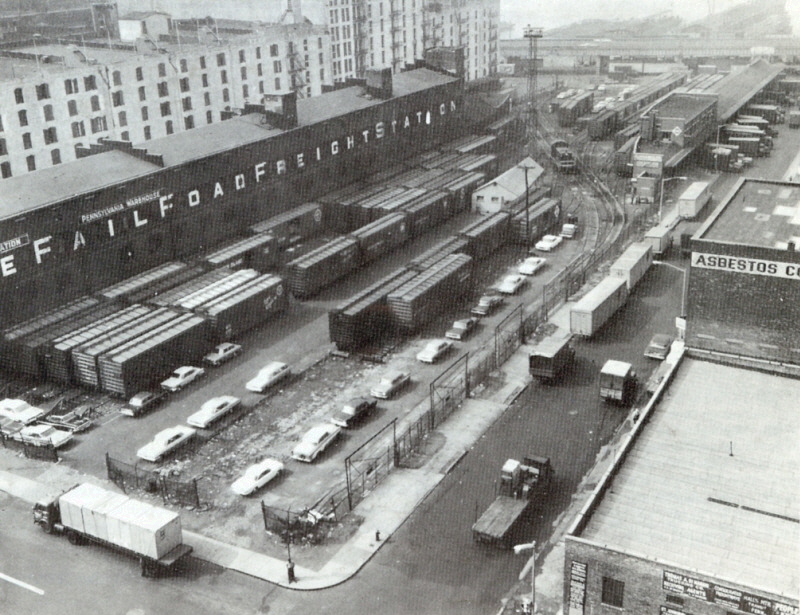 According to Tom Flagg's research, even in light of this merger, this facility in 1961 was receiving and shipping an average of thirty freight cars daily. If one counts the freight cars in view in the aerial photo below, thirty cars would occupy a great portion of the yard, so this thirty car per day might be close to the daily handling capacity for the yard. 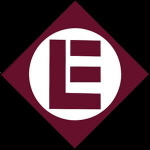 In 1960, the Erie Railroad would merge with the Delaware, Lackawanna & Western, and in essence would absorb the DL&W's property holdings throughout the East Coast. 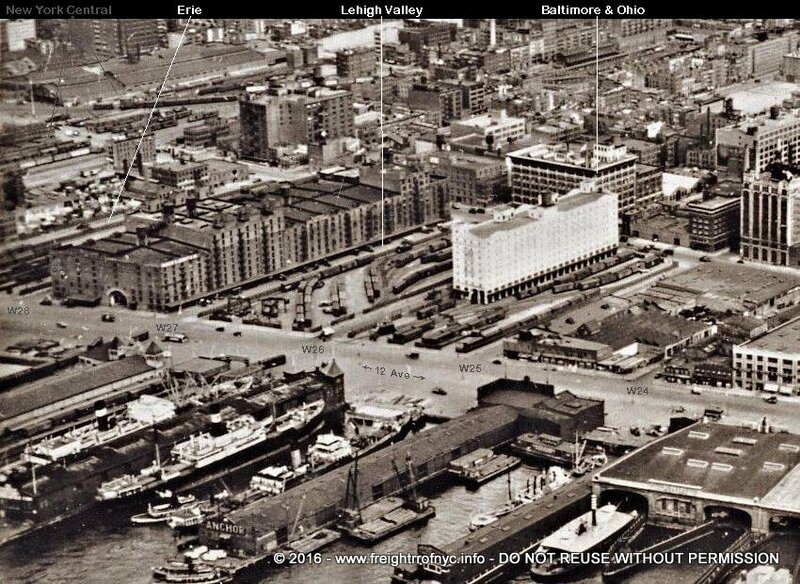 This merger added the Pier 68 Pier Station to the Erie Railroad's "West Side influence", and was one less competitor to the other railroads in the area, the Baltimore & Ohio and Lehigh Valley Railroads. Note "EL Diamond" herald on trailers. In the image above we see that the inbound freight house has a four track capacity. Track capacity was a high as five tracks. (see image in Inbound Freight House chapter). 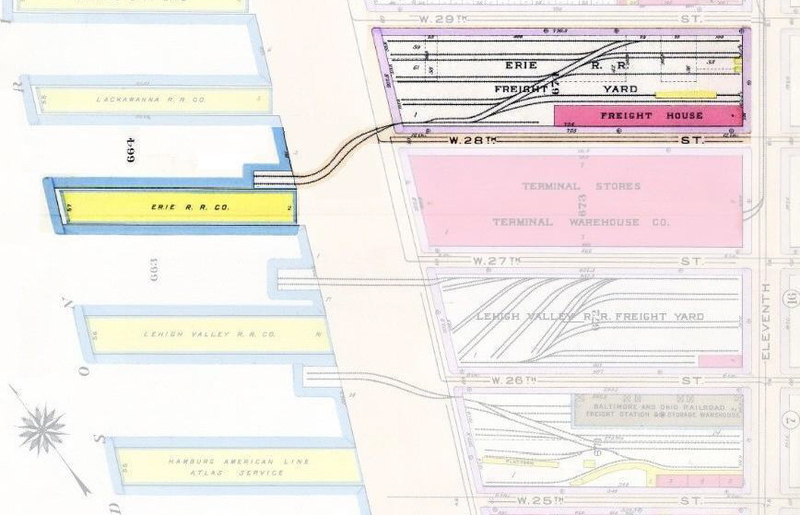 According to the 1965 Army Corp of Engineers Port Facilities close up on page 54 of Volume 2 of Tom Flagg's "New York Harbor Railroads in Color", there is a track connection to the Lehigh Valley float bridge, one block south. 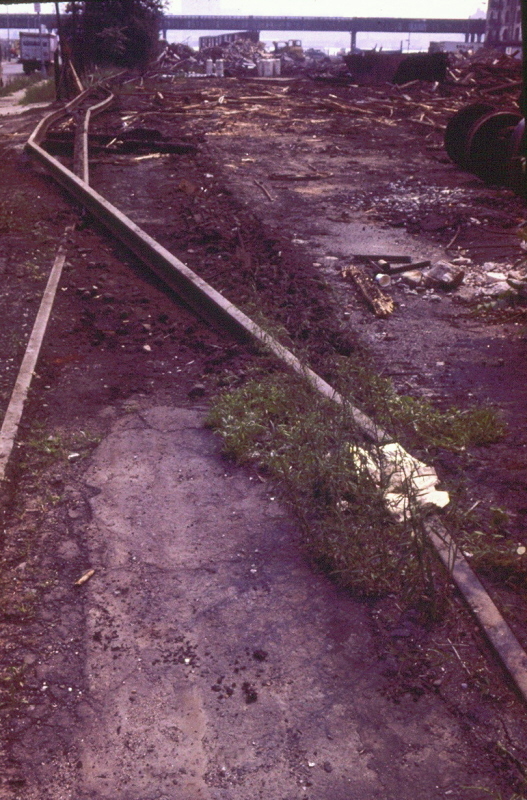 This track connection is suspect as it is not seen in the March 1972 aerial, also by Tom Flagg. Visible in the 1972 is some freight traffic in the yard and an empty station carfloat affixed to the float bridge. Inbound Freight House on right. 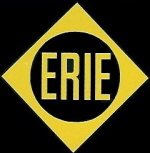 Note the blacked out center on the Erie logos on the boxcars. This photo above, also taken by Tom Flagg (also from I believe atop the now demolished West Side Highway) shows the Erie West 28th Street Freight Station in May 1974. The freight yard is mostly devoid of freight cars, but an Erie - Lackawanna SW8(?) appears to be stationed at this facility for a little while longer. 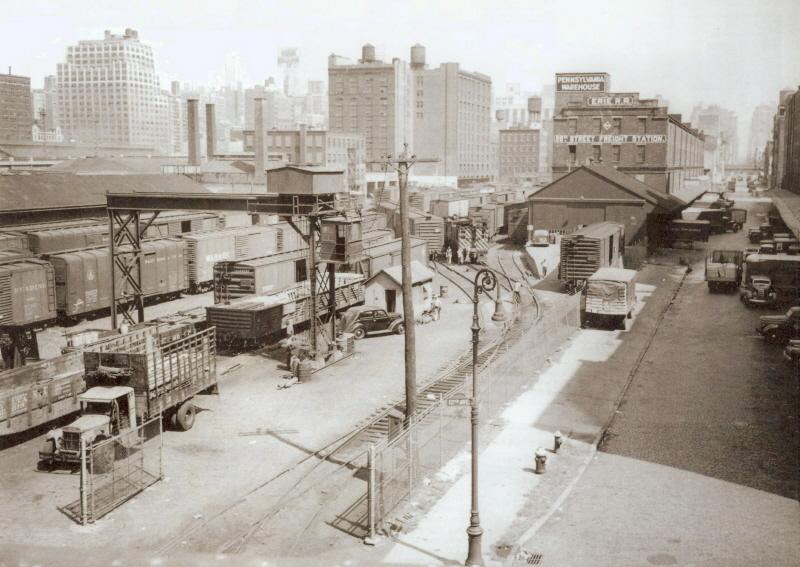 The West 28th Street Freight Station was equipped with an overhead gantry with 25 ton lifting capacity in the photo below (an enlargement from the Summer 1943 photo above) shows in detail this gantry, which replaced an earlier gantry in 1922. Take note that this gantry is stationary, being mounted to concrete footings. This authors feels that this gantry was never a movable type as evidenced by the November 1926 aerial photo above, where boxes and barrels can be discerned at the feet of the gantry. 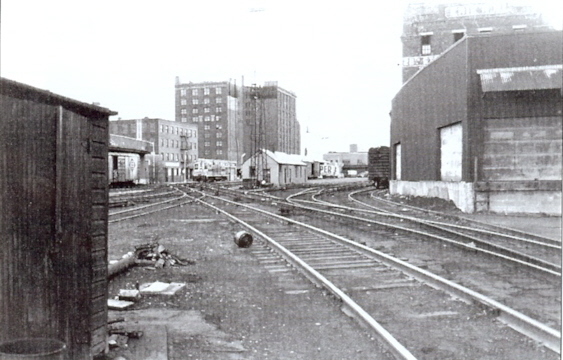 The following image, dated October 1964; shows the Erie Railroad's West 28th Street Freight Yard & Freight Station looking west (towards the Hudson River). Looking east from float bridge approach. Note track lead veering right, towards the white building on right with arched windows. This is the Terminal Stores Building and lead track for it. structure with curved brick wall and roll up doors. 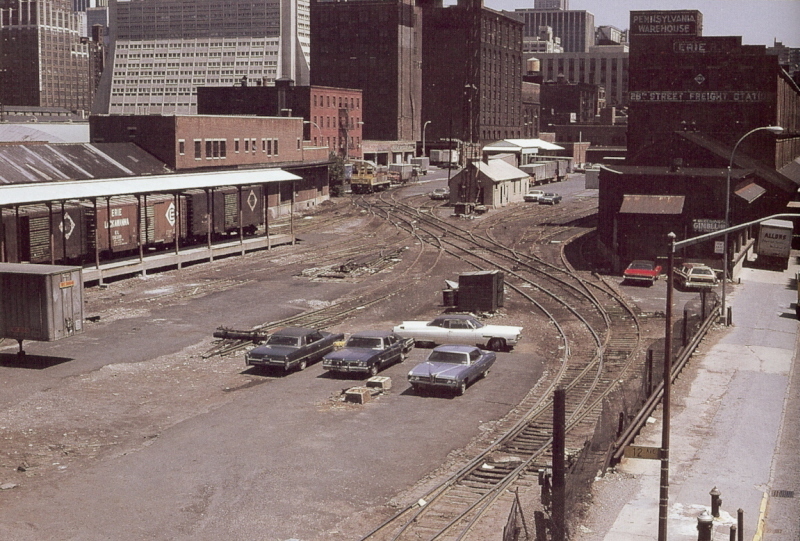 Note the EL switcher to left of white "oil house" building & yard tower. The original freight house for this facility, was located in the southeast corner of the property and four stories in height. It might have replaced a simple platform used for less than carload (LCL) freight transfer sometime circa 1905-1908. Note the employees pitching horseshoes in front of the fence! It is concluded that each of these firewalls had a firedoor on each floor that could be closed in the event of a fire, and prevent the spreading of that fire to the next section of the building, but in normalcy, would provide access throughout the building to the three freight elevators, the machinery rooms for which are the brick box shaped items on the roof and located at the from the center through the west end of the building. The illustration below right shows how this arrangement worked. The bridge plates (yellow) employees to access the left most boxcar (in red) by using the boxcars between the freight house and red boxcar as bridges themselves. The white boxcar would unloaded first, with the light gray boxcar being unloaded next. Once a pathway was clear through the white boxcar, both the white and light gray boxcars could be unloaded simultaneously. Once a pathway was clear to and through the dark gray boxcar, the red boxcar. 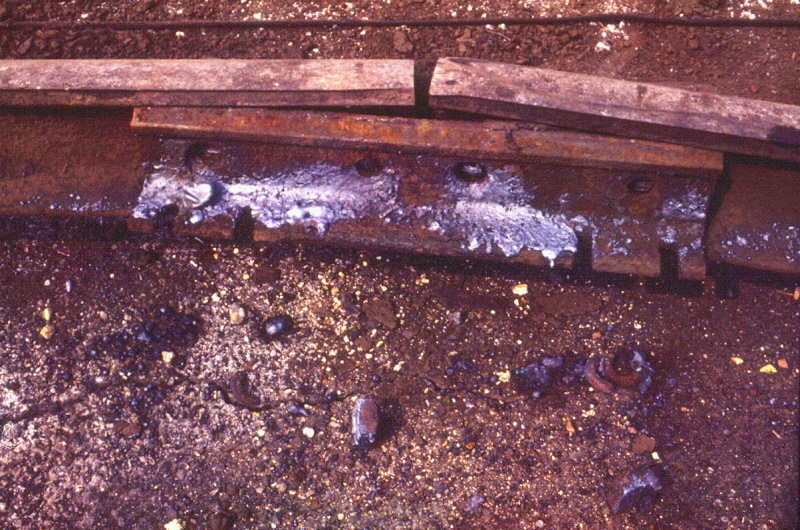 This bridge plate method would be applied to the other boxcars stationed on the freight house tracks, so more than four boxcars could be unloaded simultaneously. This method could be used anywhere the freight cars were located adjacent to the loading dock or freight door. One of the other unique things about the Erie operation at West 28th Street, is that is shared trackage with the Lehigh Valley Railroad in the Terminal Stores Building located on the next block south from the Freight Station (across West 28th Street). 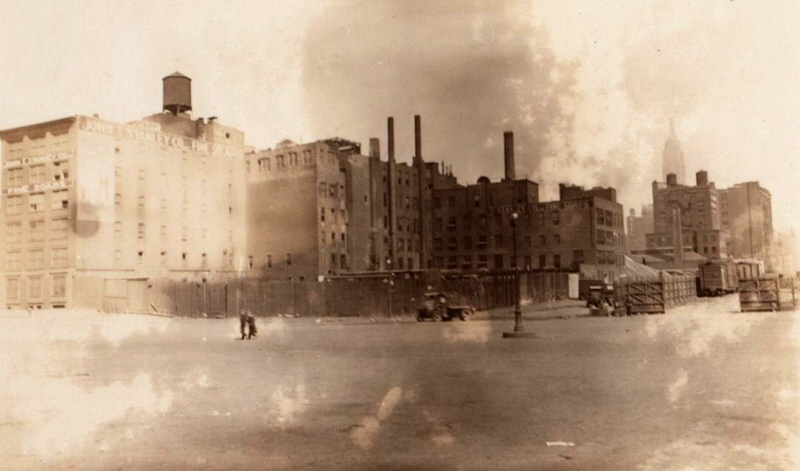 This Terminal Stores building was bounded by West 28th, West 27th Streets and Eleventh and Twelfth Avenues. 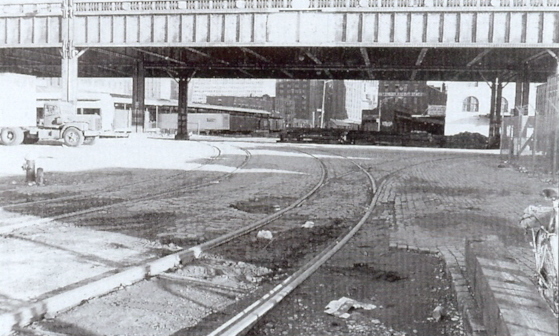 Tracks would enter the seven story structure roughly in the middle of the block on the west side (Twelfth Avenue / West Street) through a brick archway, two tracks in width. The Terminal Stores building can be seen here in a 2008 aerial photo to the right. 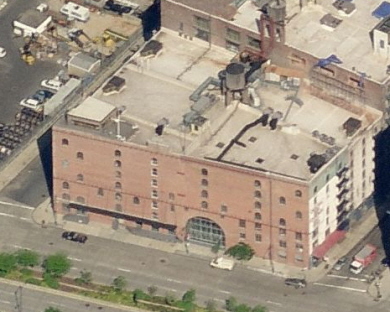 This building also once had a turnout and access for the New York Central freight line (street trackage) on Eleventh Avenue (east face) side of the building (not shown). This building was also known as the Liggett Building. This structure was also unique as it was not built as one large structure, but as twenty-four independent warehouse arranged in a two by twelve arrangement as seen in the image below. This structure remains standing to this day, although I believe the structure has been converted to residential use / condominiums. The front of the locomotive on the left edge of the photo, is a Lehigh Valley Railroad EMD model SW1 awaiting to enter the Terminal Stores building, most likely to pick up freight cars for Lehigh Valley interchange in the West 27th Street Yard (behind the photographer). A copy was fortunately made by T. Flagg! 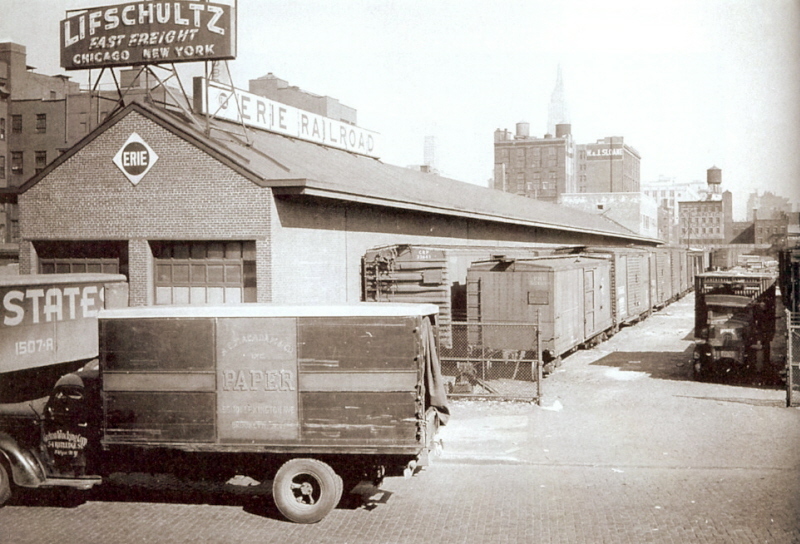 In 1936, Erie Railroad removed the northwestern most team track, and constructed a long narrow 1 1/2 story freight house on the corner of West 29th Street and Twelfth Avenue (West Street). This new building was designated for Outbound Freight. 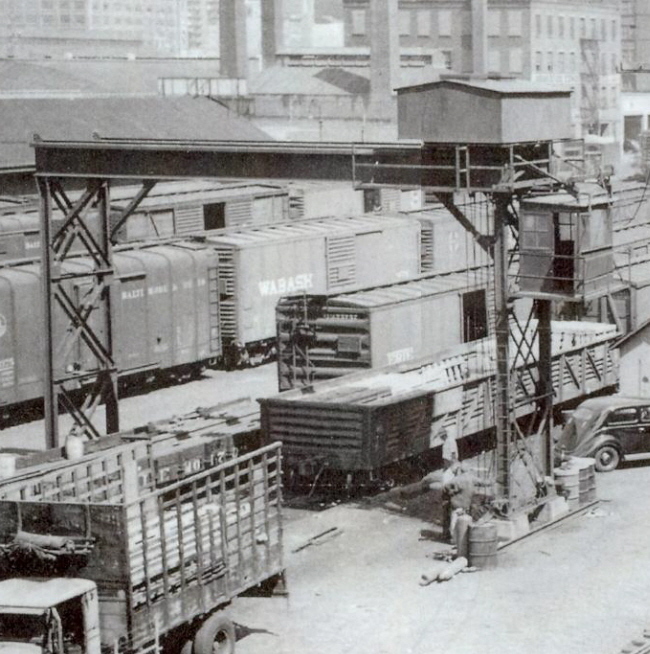 The following image, from the New York Public Library Digital Archives and dated 1940, shows the new Erie outbound freighthouse, as well as the existing gantry crane. Note the early blimp - believed to be US Navy K-Class blimp. Looking east-southeast from the West Side Highway. Compare to photo below from different angle, one year later after addition was constructed.
. Two tracks along the south wall provided freight car access, via a bridge plate, used to bridge the gaps between the boxcars on adjacent tracks. (Notice the other plates already in place behind the employee leading to and giving access to other boxcars. The illustration below right shows how this arrangement worked. The bridge plates (in yellow) employees to access the left most boxcar (in red) by using the boxcars between the freight house and red boxcar as bridges themselves. The white boxcar would unloaded first, with the light gray boxcar being unloaded next. Once a pathway was clear through the white boxcar, both the white and light gray boxcars could be unloaded simultaneously. Once a pathway was clear through the light gray boxcar, the dark gray boxcar would be accessed next and finally, the red boxcar. This method would be applied to the other boxcars stationed on the freight house tracks, so more than four boxcars could be unloaded simultaneously. Looking east-northeast from Twelfth Avenue. In 1944, an extension was constructed onto the east end of this structure which was a full two stories in height. This addition would provide additional platform space on the first floor and provide space for offices and rooms (lockers, bathrooms, etc) for the twenty or so people employed during this era, on the second floor. 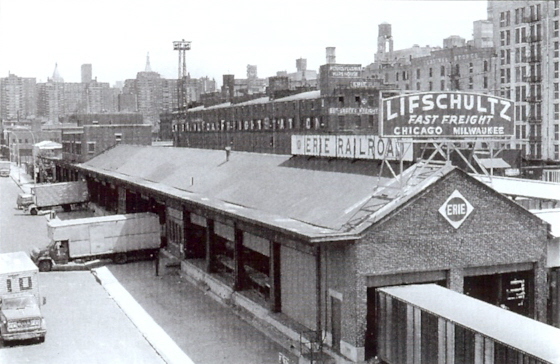 When this construction was completed, it would serve as a shipping depot for Lifschultz Fast Freight (New York - Chicago) as well as Arrow and Railway Express, also contract freight forwarders. Looking east-southeast from West Side Highway. 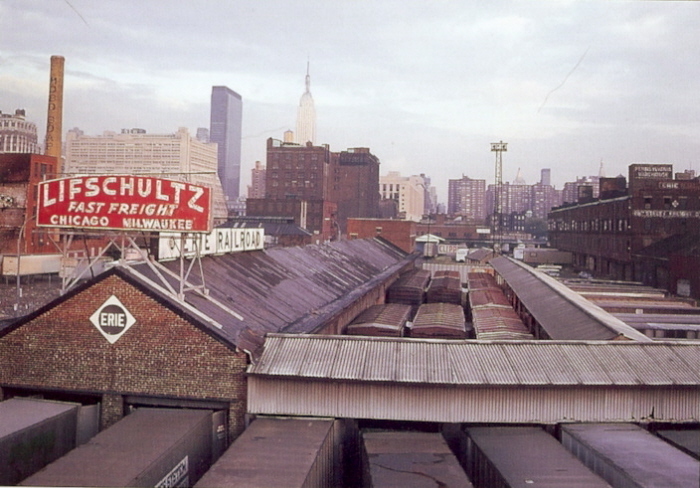 This photo above, also taken by Tom Flagg (also from I believe atop the now demolished West Side Highway) show the second or Outbound Freight House in color. At the time of this photo, another track has been installed along the southern wall of the freight house, increasing the capacity to three tracks, and a covered platform to the south of that. By the date of this image above however, the boxcars between the freight house and the covered platform are being used by Lifschultz Freight for storage and are not being interchanged via carfloat. If you take notice, there are no other freight cars in the rest of property, and tractor trailers now occupy the loading bay doors along the inbound freight house in the right background. 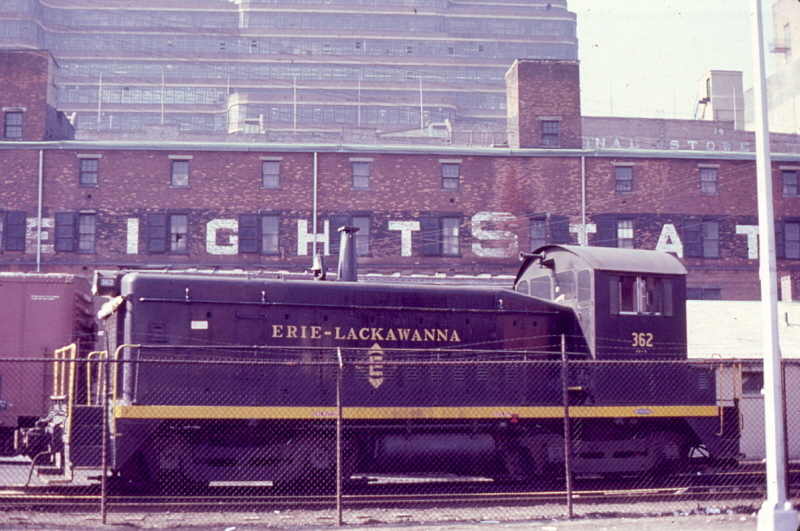 According to "Erie-Lackawanna in Color, Vol. 3", by DeYoung (Morning Sun, 1994, p.127) it states that the terminal closed on September 29, 1975. 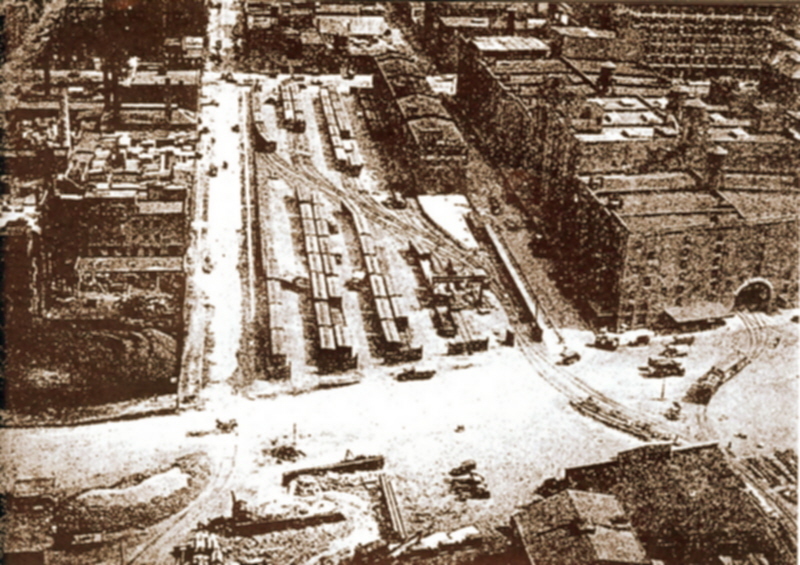 By 1979, rail traffic is no longer seen, but some of the original structures remained. Just one year, the entire block would be devoid of trackage, structures and any remnants of the Erie Railroad's presence at this location. West Side Highway in background. 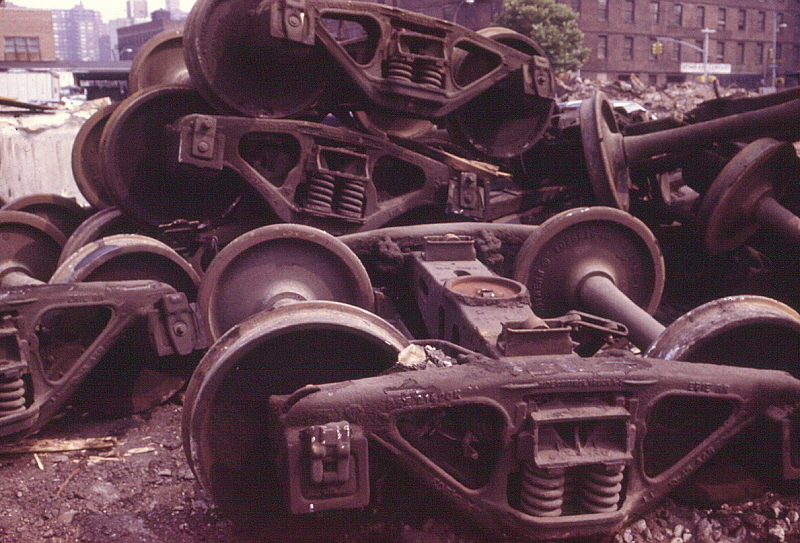 Piles of friction bearing trucks. Believed to be from the landlocked boxcars formerly used for storage. Demolition is rarely pretty. Especially on the last of Manhattan's West Side offline terminals. 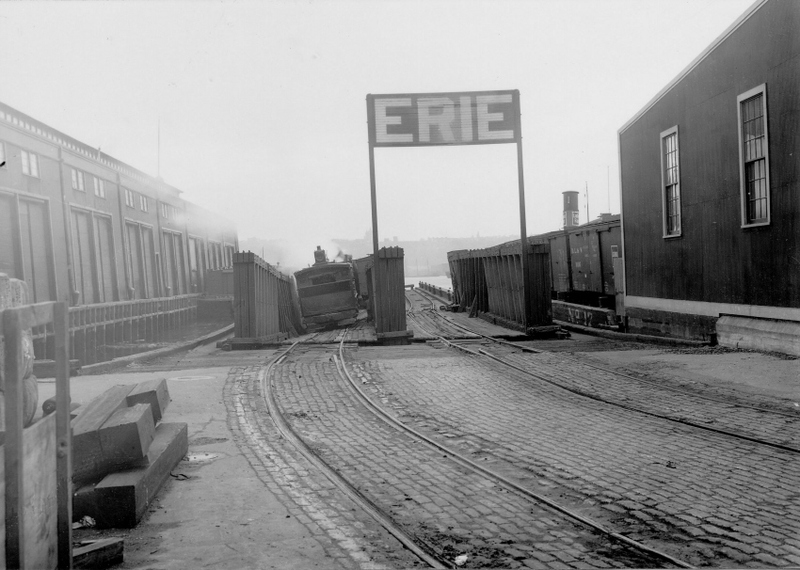 The Erie Railroad originally occupied Pier 67 between West 27th and West 28th Streets, on the Hudson River. Carfloats would be moored directly to the pier for loading / offloading to and from the pier shed, which ran the full length of Pier 67. Pier 67 would originally be leased to the Panama Railroad Steamship Company. On an unknown date, it would be occupied by Erie Railroad themselves. A map of Railroad & Terminal Facilities in the Port of New York, issued by the New York Central Railroad in 1943, shows Pier 67 occupied by the Erie Railroad and Pier 68 occupied by the Delaware, Lackawanna & Western Railroad. 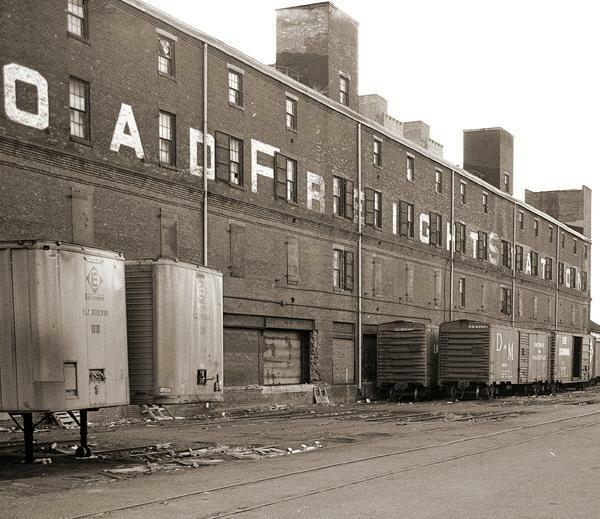 Pier 68, was a far as can be ascertained, was always occupied by the Delaware, Lackawanna & Western Railroad, but they would not have a freight yard here. The 1960 merger of the Erie Railroad and the Delaware Lackawanna & Western Railroad into the Erie - Lackawanna Railroad would add Pier 68 Pier station to the Erie Railroad property holdings on the West Side of Manhattan. 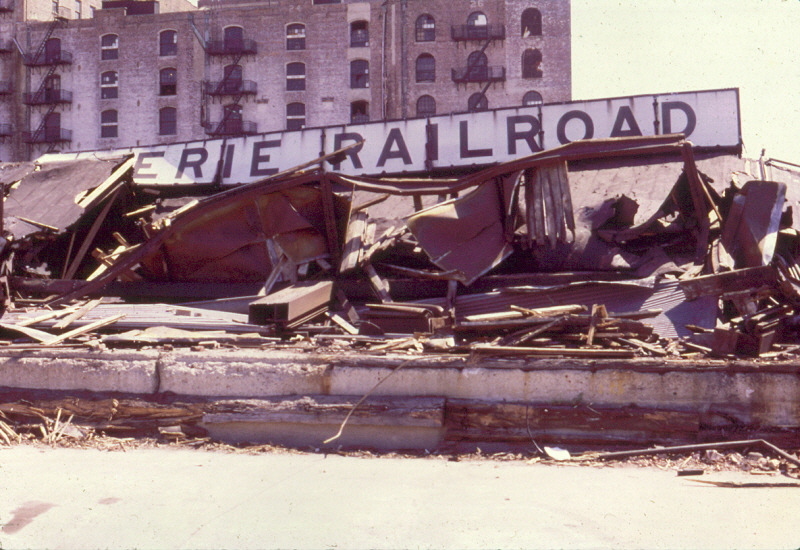 However, by circa 1965, Pier 67 was not occupied by any railroad, with only Pier 68 being occupied by the by the Erie - Lackawanna Railroad. With the formation of, and Erie - Lackawanna subsequently being absorbed into Conrail, which wanted nothing to do with Rail - Marine operations of any sort. Therefore, the West Side Pier Stations and Freight Terminal properties would be sold off, ending almost 70 years of Erie Railroad presence in Manhattan. The float bridge used by the Erie Railroad at this facility would be located just south of the foot of West 28th Street, in between Piers 67 and 68. Directly to the north of the float bridge bulkhead would be a Erie Railroad Bulkhead Shed. This facility used two float bridges throughout its history. The first float bridge which as expected, was a wood Howe Truss. This float bridge was installed in 1909, and served the facility until circa 1950. Pier 67 on left - Erie Railroad Bulkhead Shed to right. Note steam locomotive and torsional twisting of the float bridge! The second float bridge to have been used at the West 29th Street Freight Station, was a pony plate girder. It is this type of float bridge that is seen in the 1931 aerial photograph (not shown here), the 1954 aerial photograph shown above and the Tom Flagg image below. 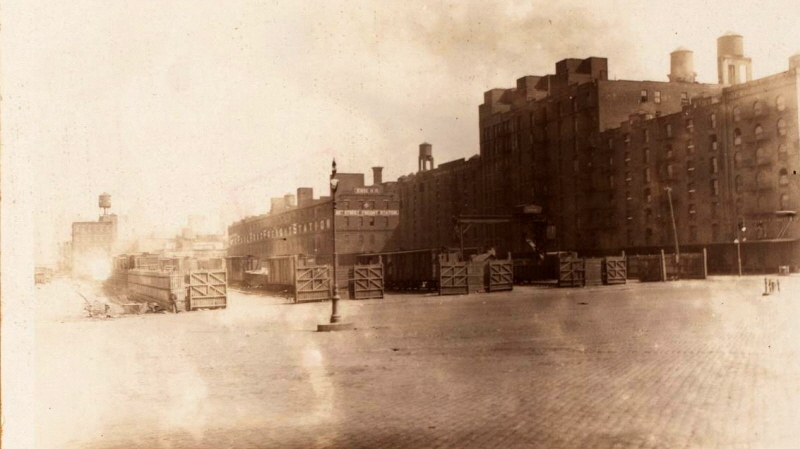 In the image below, which was taken by Tom Flagg (no date mentioned); we see the pony plate girder float bridge as it appeared at the West 28th Street Freight Station. 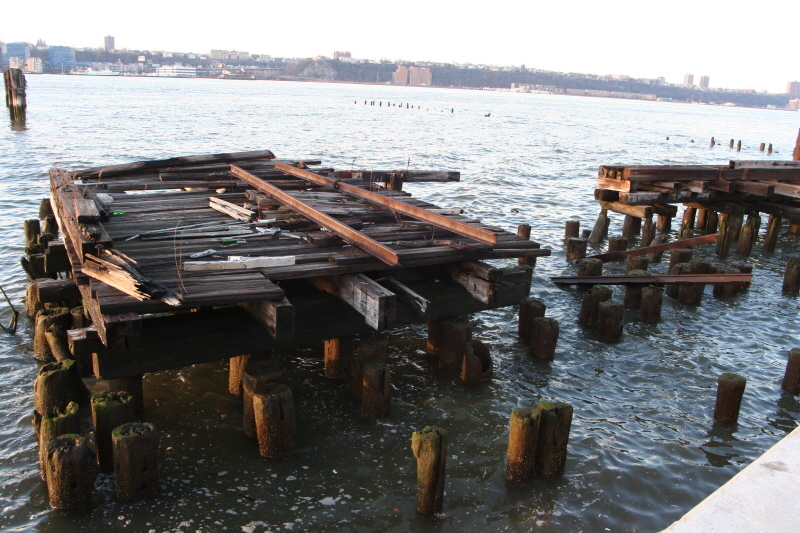 We can also see the remains of Pier 68 behind the float bridge. According to DeYoung's "Erie-Lackawanna in Color, Vol. 3" (Morning Sun, 1994) p. 127 states that the terminal closed on September 29, 1975, so I think it safe to conclude that the float bridge was not longer used after this date as well. The wooden float bridge approach in the image below, can be seen between the concrete bulkhead and both the Howe Truss and Pony Plate Girder float bridges in the images above, was photographed by Paul Strubeck on December 27, 2007, where it still remains to this day. 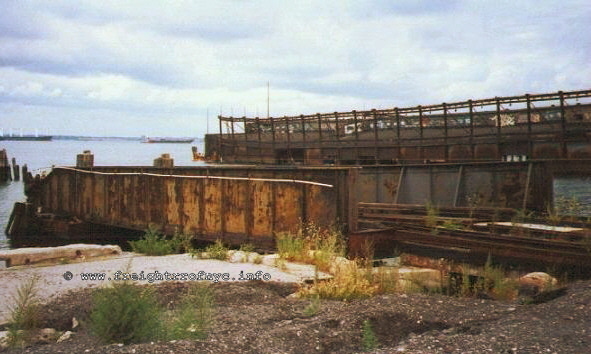 The Pony Plate Girder float bridge was relocated to the Brooklyn Army Terminal (adjoining the north edge to the LIRR Bay Ridge Yard) by New York Dock Railway in 1981. 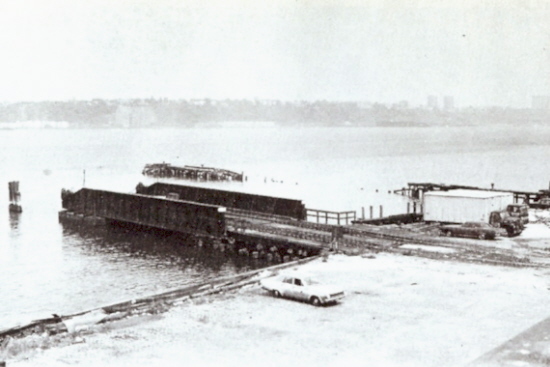 It was originally believed that the relocation and installation of the float bridge at Brooklyn Army Terminal was to ease congestion of Bush Terminal, and to avoid the sharp curves approaching the Bush Terminal float bridges and be be able to the handle railcars of longer length which were gaining use by the Class 1 railroads. 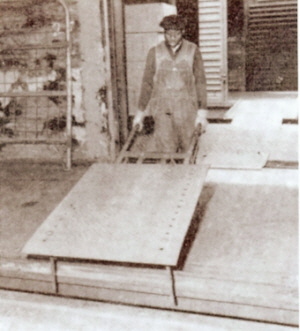 This turns out not to be case, and in reality this float bridge was installed at this location while the City of New York underwent the construction and resurfacing of First Avenue, which temporarily blocked the First Avenue right of way. 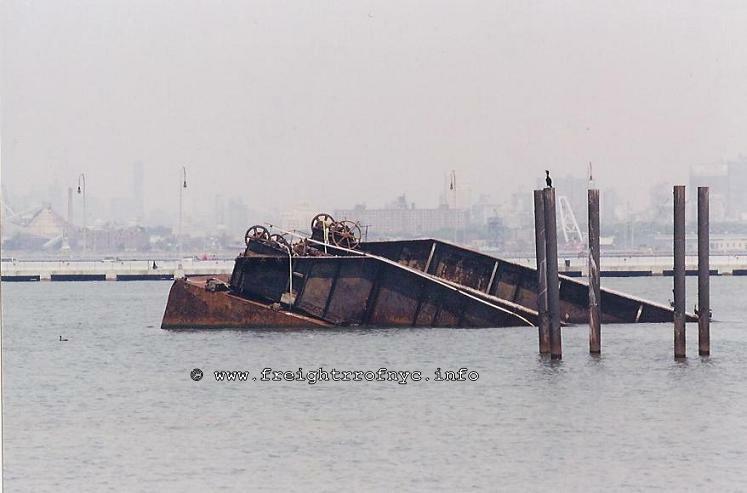 It has pulled away from its bulkhead anchors (believed to be during the 1992 Nor'easter storm surge that inundated the shorelines of New York City). The inner end (land side) is underwater which does not float as the outer end does. As the pontoon is still watertight, that end still floats. Usually, it is the pontoon that usually leaks from age, and the outer end sinks. "612 is a member of the next to last class built before the "modern" series began, the B5 and B6 classes. I have a copy of the photo you sent. 612 was built in 1887, in the Susquehanna Shops. (Susquehanna PA) of the ERIE as New York, Lake Erie & Western (an earlier corporate manifestation of the ERIE) 25. It was renumbered to 412 in 1889, and again to 612 in 1895. In 1914, it was rebuilt to the form you see in your photograph. I don't think I have a photo of these engines as built, only as renovated. No. 612 was sold for scrap in 1927." So, it is with the greatest thanks to Schuyler (and Jay for pointing me in Schuyler's direction) we now have information for #612. Lapse forward to 06 July 2009 when Chris Schmuck sends a December 1912 image of #612, and wearing a steam dummy shell no less! This image, which is part of the Erie Lackawanna Histrical Society archives, can be see below and I am anticipating on acquiring a better image of this photo in the future. The original caption accompanying the image in the issue of "The Diamond" stated that #612 is a member of the B-1 class.
. 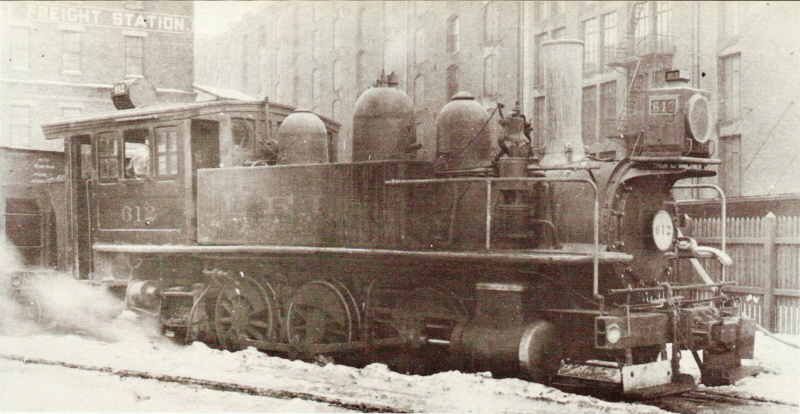 Upon the passage of the Kaufman Act, which in effect eliminated the use of steam locomotives within city limits; those railroads operating with the city confines had to turn to alternate methods of motive power. This coincided with Ingersoll - Rand's development of an internal combustion boxcab locomotive. You can read more about the Kaufman Act on the main page of this website: Kaufman Act. It is clearly understood, that due to the passing of anti-smoke legislation by New York City, steam locomotives were forced out of service in this borough and necessitating the railroads in New York City to purchase diesel-electric locomotives. 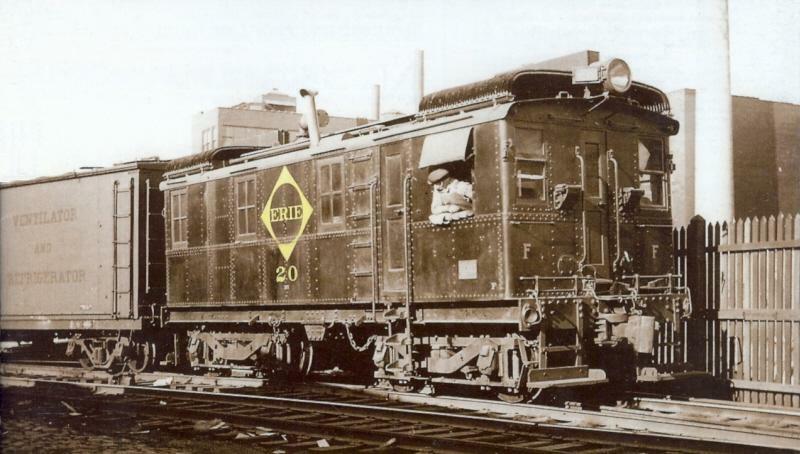 Erie Railroad #20 was a 60 ton oil-electric boxcab locomotive that was built in 1926 by American Locomotive / General Electric / Ingersoll Rand. 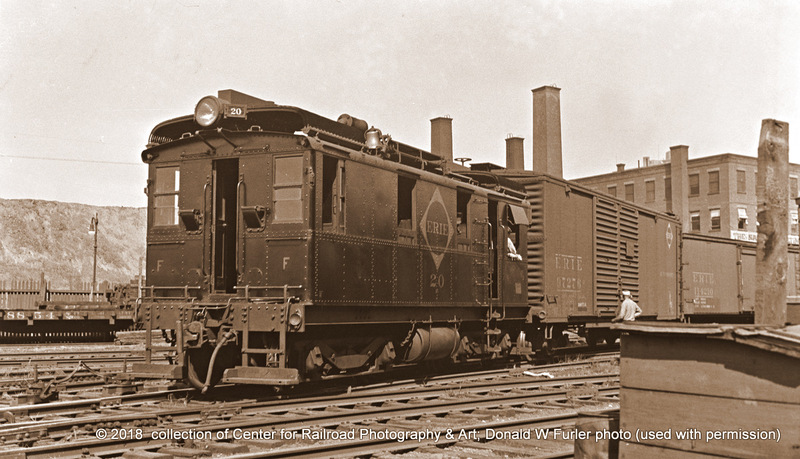 This locomotive was the sixth oil-electric boxcab in a long line of boxcabs constructed by A/GE/IR, following the success of CNJ #1000 boxcab built the previous year. 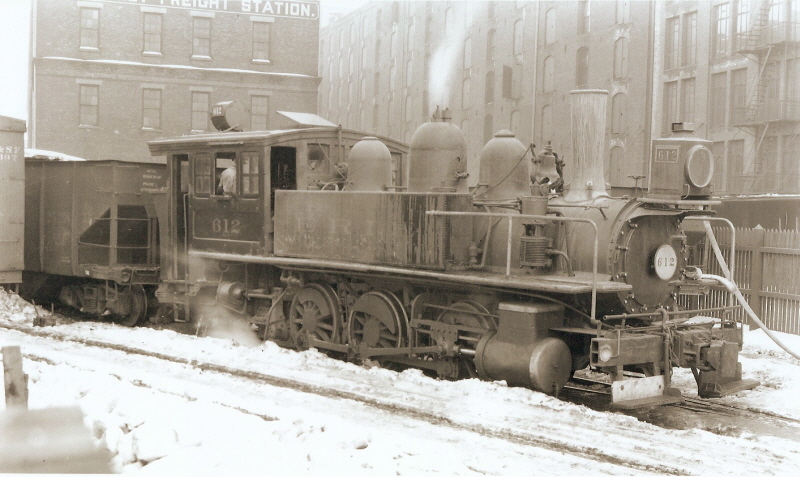 There is a distinct possibility that sister locomotive #19 operated here as well. 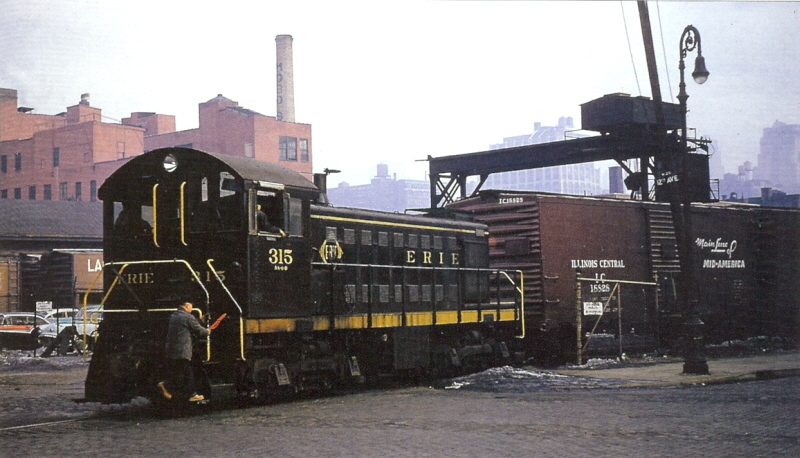 Erie Railroad locomotive #304 was an American Locomotive Company model HH660, denoting 660 horsepower, high hood design. Disposition on this locomotive is not recorded in the builders records. Erie Railroad locomotive numbers 308, 311, and 315 were all American Locomotive Company model S1 locomotives. #308 is noted to have been scrapped. #311 is noted to have been sold to Precision Engine. #315 still survives to this day in Galena, Kansas, although it is very poor condition. After my father's passing, I began going through his collection of slides taken during his days of railfanning. In a carousel of slides dated August 1974 and taken at Steamtown when it was located at Bellows Falls, VT; I located an image of Erie Lackawanna #362. At first, I didn't think anything of it, thinking it was just another locomotive on display at Steamtown. That thought didn't last,when I saw the building behind the locomotive that had Freight Station on it. Much to my surprise, amazement and great pleasure, I was looking at the Erie Lackawaana West 28th Street Freight Station! I then looked at the date on the slide mount which was June 1971. How this one slide wound up in the middle of this 1974 carousel, I'll never know. Dad never mentioned taking this image, and while he took a great deal of images of the Brooklyn Offline Terminals, this is the only Manhattan Offline Terminal I have located all other images in 1971 are in other locales. Futhermore, as #362 is a SW8 model, I now feel that #362 could very well be the locomotive seen in the May 1974 T. Flagg image. Seen in Tom Flagg's photograph of May 1974, an as yet unidentified Erie - Lackawanna Electro Motive Division (GM) model SW8 can be seen in the background in yellow maroon and gray livery. Date is suspect as there is quite a bit of snow on the ground for September! Appears to be taken a few seconds after photo above. Nassau Smelting Company right background. and note Pier 68 "medallion" of West Side Highway elevated! 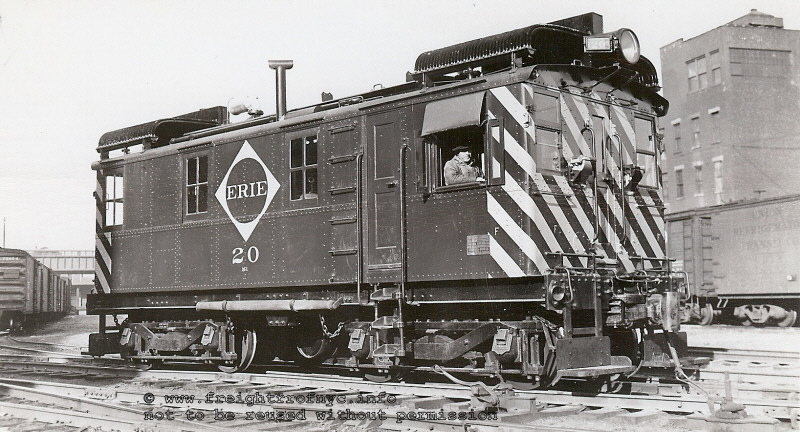 Erie Railroad #20 was constructed first in May 1926. Erie Railroad #19 was constructed in September 1928. 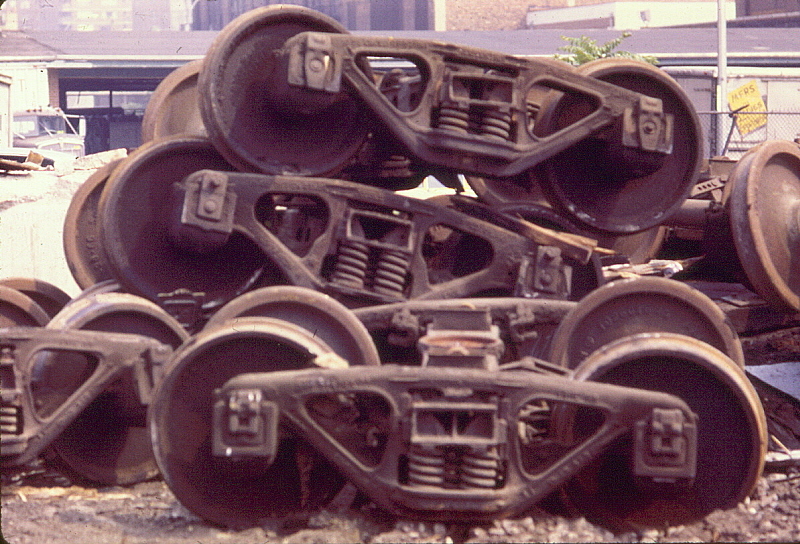 Both locomotives were scrapped in November 1958. 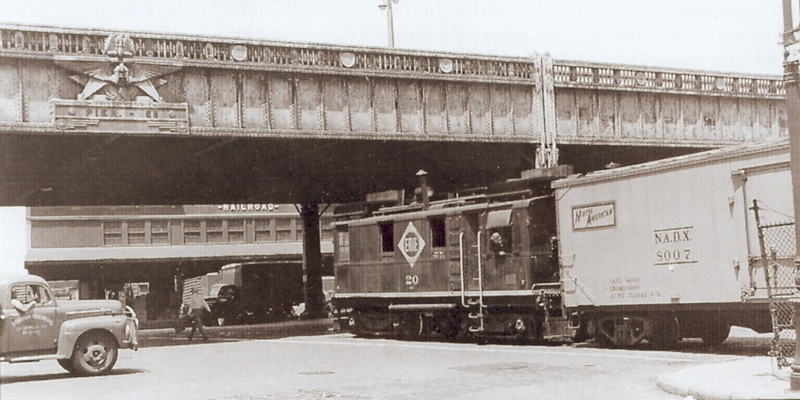 It is believed both of these locomotives served at the West 28th Street Freight Station. #25. Renumbered to 412 in 1889, renumbered to 612 in 1895. In 1914, it was rebuilt. Sold for scrap in 1927.. 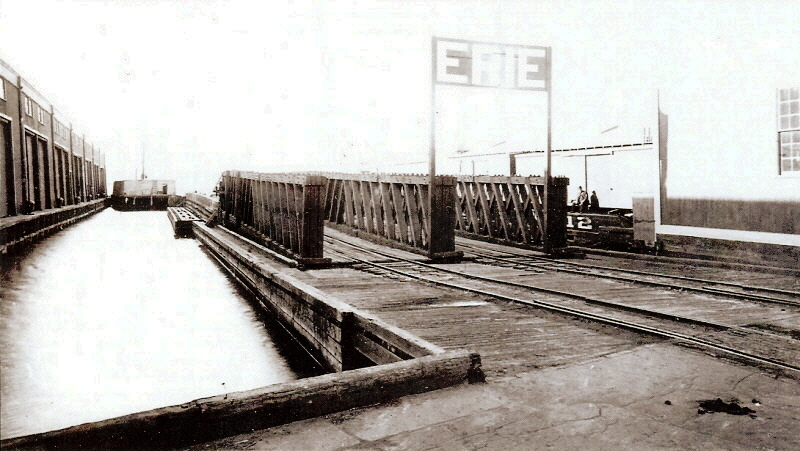 Being a Erie Railroad operation, and subsequently an Erie - Lackawanna; the Pier Stations and float bridge would have been serviced by Erie / Erie Lackawanna Railroad tugboats, carfloats and lighters. Keeping in mind the large amount of marine equipment that the Erie / Erie - Lackawanna Railroad owned and operated a Marine Roster on this website would not be beneficial or justified; and therefore will not be forthcoming. The following freight bill was located in my father's collection of paper. 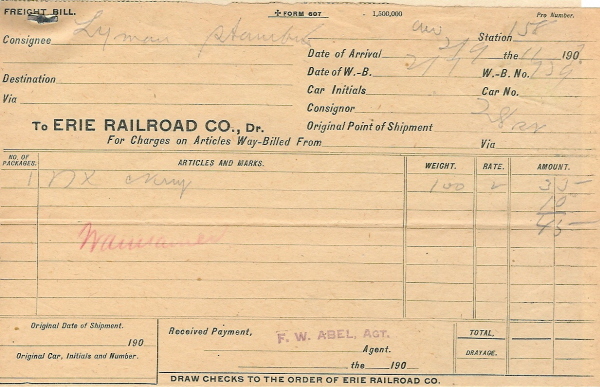 It was attached to two other Erie freight bills originating at Duane Street and an Erie Railroad receipt.